Sympathy cards are often hard to create, but we all need them....I created this card for a blogging friend Beckie who participates in my Bloggers Challenge Group. I used my Blue Frost Spectrum Pad (Retired SU) and the Spectrum Roll Technique to create the background. 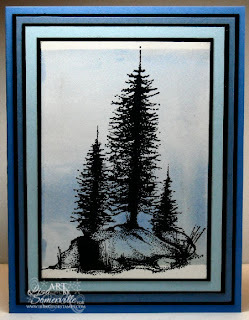 Once dry, I stamped my tree image in Black Archival. The sentiment I choose is too big to fit on the card, it reads: May Memories Comfort You, Friends Sustain You and Faith Uphold You.